DSH Pro; designs, integrates and installs turn-key Technology Solutions for the professional client across Canada. Our markets include Educational Institutions, Businesses, the Government, Hospitality, MDU, House of Worship, Retail, Restaurants, Sports Bars, Financial Institutions and Health Care centers. DSH will provide the perfect solution for your environment and budget. Just as important, consistent reliability and after sales service is paramount. Whether you’re looking to impress with state-of-the-art audio visual capabilities in the boardroom, deliver customers an unmatched entertainment experience, pro- vide employees the benefits of a smart office, or simply manage operating expenses by controlling energy use in buildings, DSH Pro offers an affordable solution for virtually any automation and control requirement for your business. In today's landscape of brand and corporate messages it's more important than ever to stand out above the rest. Not having Digital Signage is like not having a website. We can deliver a full turnkey solution through the brilliance of digital media. When you require Commercial Audio Video, Integrated Control Systems and Distributed Sound and Video, DSH will provide the perfect solution for your environment and budget. Just as important, consistent reliability and after sales service is paramount. 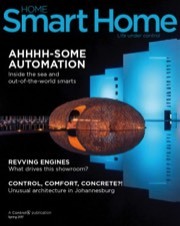 Home Smart Home is the publication that brings you the latest trends in home control solutions and smart devices. Read features and stories about people and places all over the world that have been transformed by automation. Get your FREE version of the latest issue here! Check out this issue’s light-tastic features. One of our resident experts lays out some key tricks of the trade for using smart lighting to optimize a staged home. We also visit an art gallery where smart lighting helps create the most brilliant colors you’ll ever see on a canvas! And in Dallas, take a hotel elevator all the way to the top to experience a presidential suite with no less than seventeen lighting zones. We shine a light on two incredible residences in London: one a house with impeccable interior design and the other a condominium complex where every unit comes with automated VIP treatment. Then, explore the unique architecture and design of a three-level South African home, marvel at the jaw-dropping beauty of a resort at the very tip of the Baja California peninsula, and scope out the new showroom at the hottest custom car garage in America. We are an ethical firm where buyers and sellers can trust each other. A CEDIA Certificated firm offers you the finest in custom electronic residential design and installation ... and peace of mind. As a Control4 Premier Dealer, we are uniquely qualified to make your life Everyday Easy.